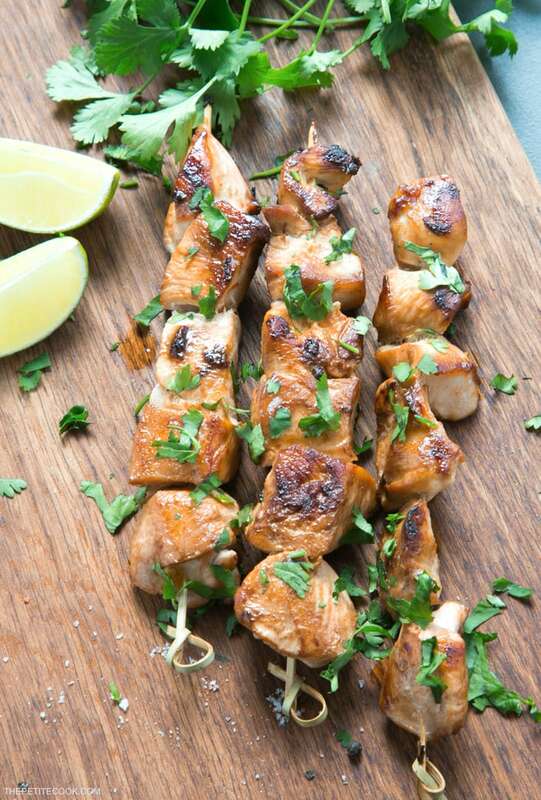 Skewer recipes are perfect for summer time grilling – These tasty Beer Lime Chicken Skewers are packed with vibrant aromatic flavors and super easy to make ahead. Definitely one of my go-to grill recipes -These Beer Lime Chicken Skewers are ridiculously easy to put together, and a great way to entertain guests at your next BBQ party. I mean, what’s better than the Beer + Skewers + BBQ combo?! These Beer Lime Chicken Skewers take no time at all. 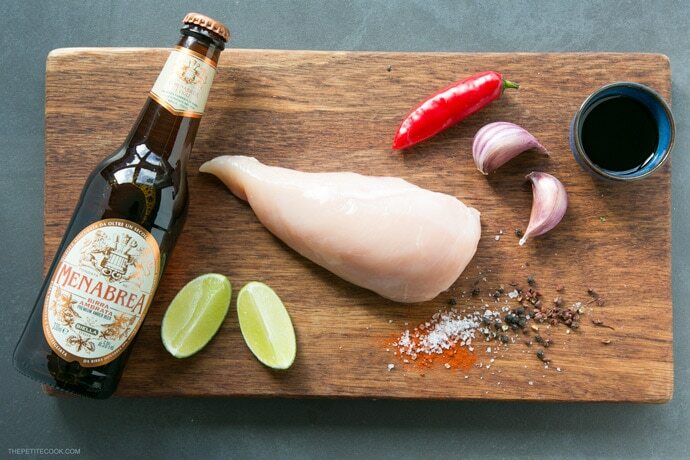 All you need is 7 simple ingredients: chicken breast, chili pepper, soy sauce, lime juice, garlic, hot/mild paprika and of course BEER! 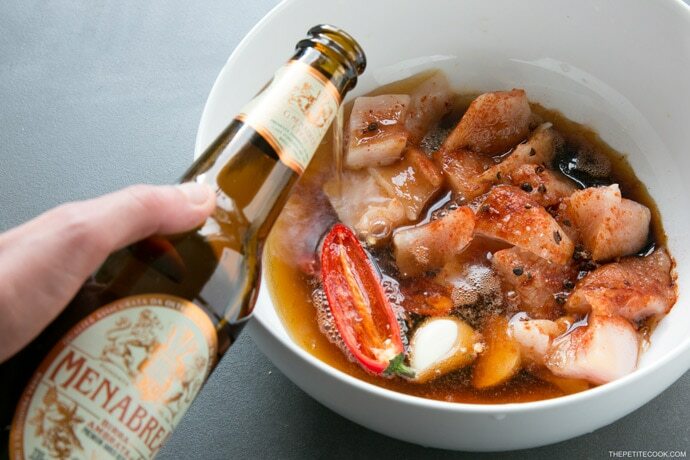 The beer is the real star of the recipe, with its double action of both tenderising the meat, and giving a deep aromatic flavor to the whole dish. I went for the Ambrata from Menabrea, the most ancient brewery in Italy. I’ve collaborated with this Italian brand before to make an extraordinary Beer Cake, and can’t recommend it enough! This time around, I’ve opted for their amber beer. The Ambrata is a well-balanced beer with a marked floral fruitiness and a slightly bitter undertone, making it a great choice both for the marinade and to accompany the finished dish. The simple marinade is effortlessly easy to put together. 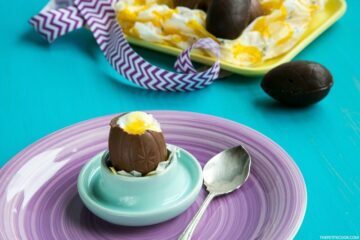 All you have to do is combine the ingredients and mix them all up in a large bowl. Then add your chicken cubes into the bowl, and submerge them with the beer. *Make sure to drink any leftover beer while you wait for the chicken to absorb all the marinade flavors*. Let the chicken marinade for a couple hours, the longer you leave it the better it will taste and the more flavor it will have. I usually prepare this the night before and let it marinate in the fridge until next day. Then all you have to do is thread the chicken on skewers and grill ’em. Juicy, tender, tangy, crispy, deliciously savory. 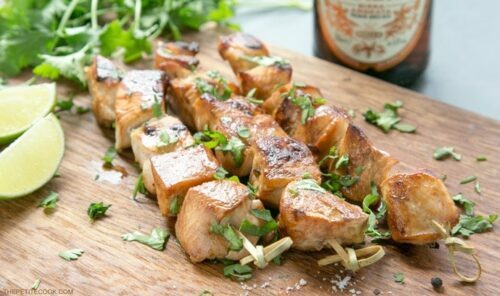 These Beer Lime Chicken Skewers are a light but tasty addition to any BBQ party. And quick enough to be made during the work week for an easy fuss-free dinner option. Do you like grilling with skewers? 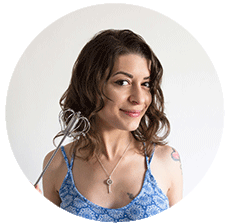 If you haven’t tried it before, you should, because skewer recipes are super fun and versatile! You can add your favourite meat & veggies altogether at once, which makes dinner prep a breeze. I love making these Beer Lime Chicken Skewers on their own, but they are just as great with some extra veggies such as zucchini, onion and peppers, skewered between the chicken pieces. 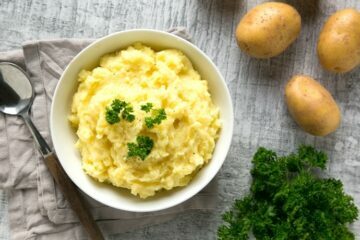 To make this recipe simpler and lighter I’ve used chicken breast. However I also recommend boneless skinless chicken thighs, which are more flavorful than chicken breasts and easier to cook without drying out. For an extra flavorful marinade, you may also place all the marinade ingredients in a food processor and pulse until smooth. 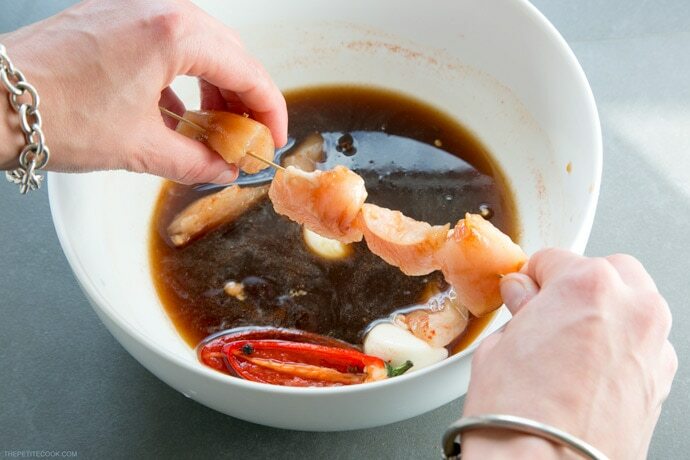 Then transfer the marinade into a large bowl, fold in the chicken bites, and pour over the beer. Juicy, tender, tangy, crispy, deliciously savory. 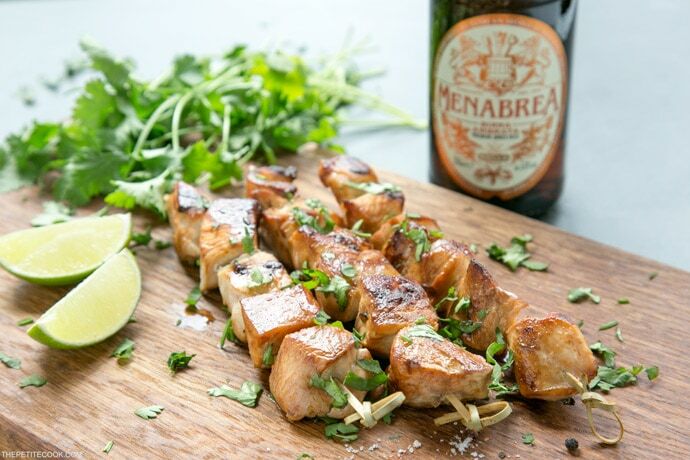 Beer Lime Chicken Skewers are a light tasty addition to any BBQ party. And quick enough to be made during the work week for an easy fuss-free dinner option. In a large glass bowl, combine lime juice, halved chilli, garlic, soy sauce , paprika, sichuan pepper and mix them all together. Add the chicken, season with salt and pepper and stir to coat. Cover and place in the fridge for at least half an hour to marinate. Thread 4 pieces of the chicken onto the bamboo skewers. Preheat the grill and grill for about 10-15 minutes, brushing with olive oil through cooking time. Remove from the grill when the chicken is cooked through and the surface is golden-brown and crisp. 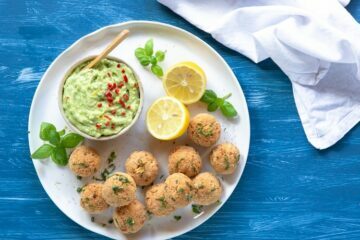 Serve immediately with some lime wedges. You can grill these beer chicken skewers in an oven. Preheat oven to 200C/400F and grill for about 15 minutes or until fully cooked, turning the skewers halfway through cooking them. If you're using bamboo skewers, soak your sticks in water for at least 5 minutes, to prevent burning. These chicken skewers look amazing! I always love adding beer to food but haven’t tried adding it to any chicken dish! These skewers look easy and delicious!